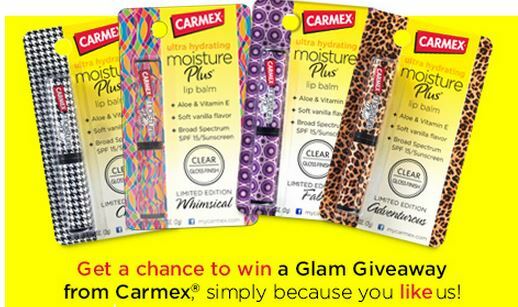 Head over & give Carmex a “Like” on Facebook to enter the Glam Giveaway. They are giving out 48 prize packs, each containing 4 Carmex Moisture Plus® Clear lip balms and a small make up bag. Best part, you can enter once every 24 hours! Sweepstakes only open to legal residents of the 50 U.S. and D.C., 18 years and older. Sweepstakes begins on or about 9:00 am CT on 7/15/2013 and ends at 8:59 am CT on 8/26/2013.